A proposed 120 unit townhouse development was underlain by old fill soils consisting of construction rubble and silty and clayey soils. In addition, a number of the units were located within 25 feet of the top of a 20 foot high fill slope. 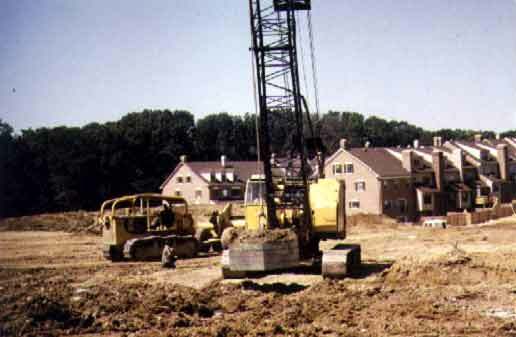 The townhouse units were located within an exclusive area of Fairfax County, with the selling price of the units going for greater than $400,000 each (1983 pricing). The primary concern with development at the site using shallow foundation support was in the potential for excessive settlement. Dynamic compaction was recommended by the geotechnical engineer and was selected by the developer to overcome this problem. The project was reviewed and approved by the local Fairfax County Geotechnical Review Board, which consists of three practicing geotechnical consultants. A total subsidence of the ground surface of 1.5 feet (approximately an 8 percent strain) was achieved by dynamic compaction. Standard penetration testing performed after the dynamic compaction verified an allowable bearing pressure of 3 ksf. Dynamic cmpaction was performed using an 8 ton weight dropped within 75 feet of previously constructed units. Vibration levels were always below accepted damage threshold values. The work was completed in the early 80’s and no detrimental post-construction settlement has been reported.